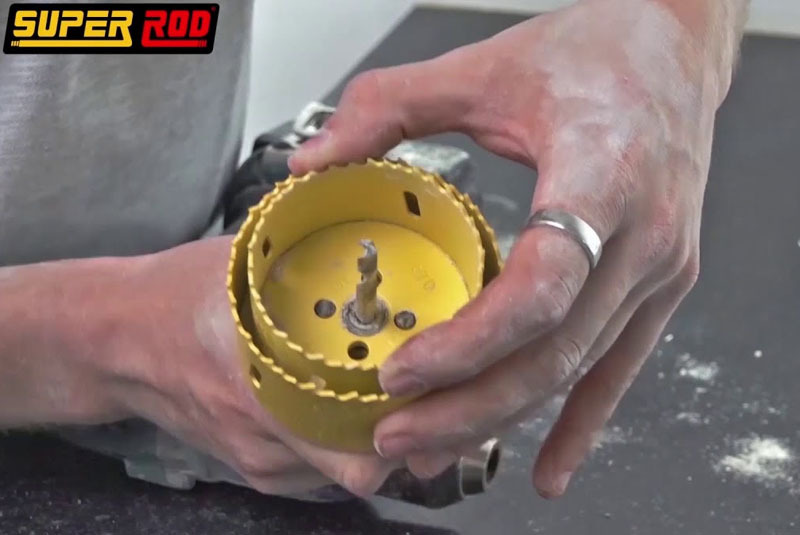 For this product test Gary Fisher of Lougar Electrical tries out the Duoxim Arbor tool from Super Rod to see if it really is the ‘hole’ package. Now here’s a sweet little tool that’s well worth having in your kit! Invented by electrician Kyle Gamble and developed by Super Rod, the Duoxim Arbor is essentially an arbor which can be used for cutting clean, circular holes for downlights, with the added bonus that it can also enlarge existing holes. I’m sure most of you will already have an arbor and hole cutters in your tool box so will be familiar with the concept, however the main difference with the design of this product is that the two pins that push through and hold the saws in place are longer than standard, allowing them to go through both hole saws in one easy movement. I was recently asked to take out some small, straight downlighters because the customer wanted to upgrade to a tilt version instead. My previous method of dealing with this would’ve been to try and find a cup that was the same size (or as near as possible) as the new light. I’d then draw around it, before using my pad saw to cut it out. Although it served a purpose, I found this to be a very tedious and awkward way of doing things and certainly a far less professional process then I’d have preferred. The arbor will fit all sizes and traditional types of hole saw and you simply identify the hole saw that’s the same diameter as the existing hole, attach it and drill. If you’re looking to enlarge an existing hole for a larger light, the process is the same but you just select a bigger hole saw instead. In both circumstances I found the tool to be very straightforward to use and it offered a far more professional and accurate way of achieving a clean cut hole. One thing that doesn’t change, however, is the fact that there’s still a lot of dust created, so you’ll need to get your dust sheets out and vacuum cleaner plugged in. And who said electricians never tidy up? Those points aside, this is a cracking invention that gave extremely consistent results and allowed me to cut more holes in a fraction of the time, when compared with cutting by hand. The outcome is a clean, concise hole that will leave your customers impressed. My only regret with the Duoxim Arbor tool is that I wasn’t acquainted with it earlier, as there’s been so many occasions in the past where it would have come in handy. That said, there’s no time like the present and I’ll be getting plenty of use out of it in the future. Previous : Residential Lighting: Do You Need A Personal Touch?